BWiC Profile Featuring Eileena Long, Project Manager, Pinck & Co., Inc. In a study conducted by CareerBuilder in 2014 a study of over 2,000 Human Resources professionals found that 77% of those surveyed believed soft skills are just as important as hard skills and 16% think they are more important. In the same article published by HBS it is those hard skill key words that most often land the interview when applying through a digital platform. What is most often missed before the candidate even makes it to the interview is level of character, work ethic and emotional intelligence (EQ). Many AGC MA organizational members have recognized these critical values in a potential employee and have hired them despite their lack of specific construction training or education, with the intention of providing the formal instruction needed, many times at their own (or partial) cost. Eileena Long grew up in a traditional home in Salem, MA with her three siblings and graduated from Salem High School with the intent of becoming a teacher by working days as the secretary at the school and attending classes for continued education at night. It was painfully slow going and after three years she started to weigh her options. Coincidentally, the High School was going through major renovations and Gilbane was the Construction Manager of hire. They were looking to employ a Technical Assistant for the project and through exceptional references Eileena was immediately hired. She quickly took to the work and after only 10 months she was promoted to Office Engineer followed by an additional promotion to Sr. Office Engineer the subsequent year. She said she was thrilled to be receiving on the job training with a group of amazing people that were so passionate about their work. She learned that asking the right questions along with her “personal drive and ambition” helped to further build her confidence in pursuing this new career. 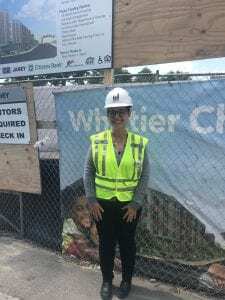 From 2008 to 2012, with the support of Gilbane, she attended night school at Wentworth and earned her Associates Degree in Building Construction. It was another tough road raising two children while working all day and attending school 3 nights per week plus Saturdays, but with the support of her family her tenacity prevailed. She shared “The experience was a balancing act” but the fact that she already had the fundamental basics under her belt made it a bit easier in the long run. Her degree, combined with her now six years of solid experience, put her on her way to an unlimited potential of occupational paths within the industry. 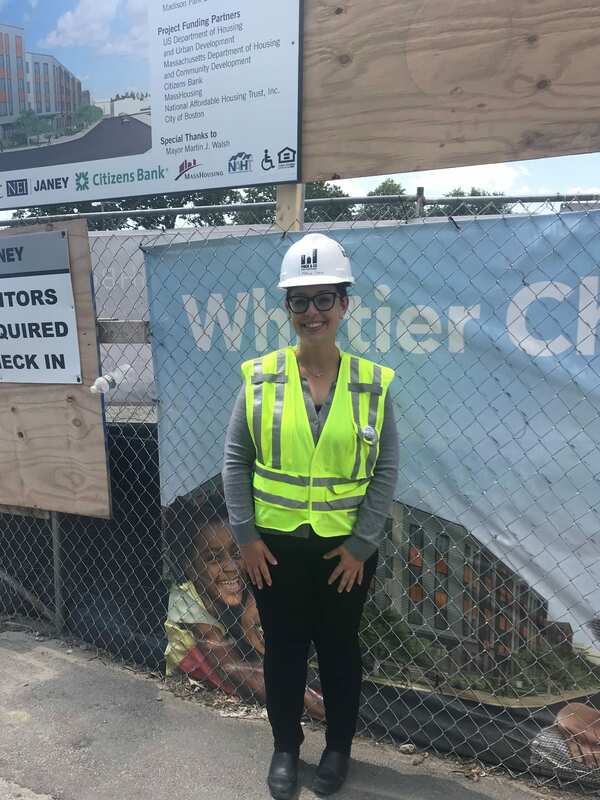 Over the next 4 years she would progress through Gilbane as Project Engineer II, Human Resources Engineer and Project Engineer III, while contributing as Co-Chair to the Advance Peer Group, a team supported by Gilbane to enhance the development and advancement of women in the industry. As much as she enjoyed working at Gilbane, she realized it was time to explore more opportunities and joined Wise Construction Corp., where she was able to work as Project Manager on 4 significant projects that included: Mass Eye & Ear Infirmary MRI renovation, Mass Eye & Ear Infirmary Front Lobby Renovation , Dana Farber CRC Longwood Galleria and the Harvard Yard Child Care Center Playground. She said it was a terrific experience but helped to appreciate that she wanted to take on a more integrated role that included being a part of the decision-making process. She said the owner side of the industry offered an opportunity to take on a different perspective and a relatable view-point by representing the client, so in February of 2018 she joined Pinck & Co., Inc. as a P.M. In this function she is now able to have more voice in the collaborative development of each project, and as a woman she shares this can sometimes be a bit more challenging in a room entirely full of men. That is where self-confidence, the ability to ask questions, and gaining trust through long-term relationships all come in to play. It’s a small business community, and Eileena says word gets out on performance history, so it’s critical to deliver on a continued basis. Congratulations Eileena on your very successful path to wiser and better-you do not have far to go! Thank you for sharing your experiences and supporting our mission of Building Women in Construction!